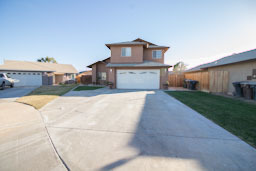 Don&apos;t miss out on this great opportunity to own this stunning home, at a great price, in a quiet cul de sac in a well established Imperial neighborhood. This turn-key property features 4 bedrooms, 2.5 baths, 1, 521 sq ft, and vaulted ceilings. Pride of home ownership is evident as you walk through and notice the recently upgraded kitchen which features granite counters, crisp white cabinets, modern back splash, and stainless steel appliances. Several key features to notice are: newly renovated half bath, beautiful wrought iron stair rails, separate family leading to the backyard, manicured yards with beautiful landscaping, concrete patio on side yard, covered back patio, detached storage shed, extended driveway to allow for RV parking, and a completely finished garage! It&apos;s truly a must see! Don&apos;t let this one get away!